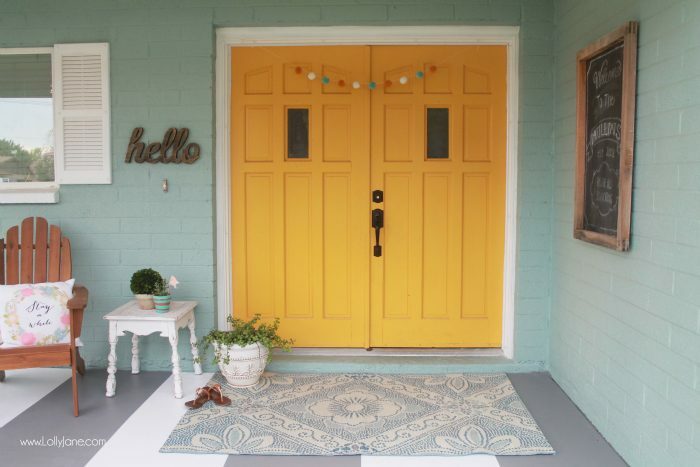 I painted my house a pretty shade of aqua earlier this year (the paint code is 417152525780 and I had it mixed at Home Depot via Glidden Paint) and really want to make sure each nook and cranny is decorated too! 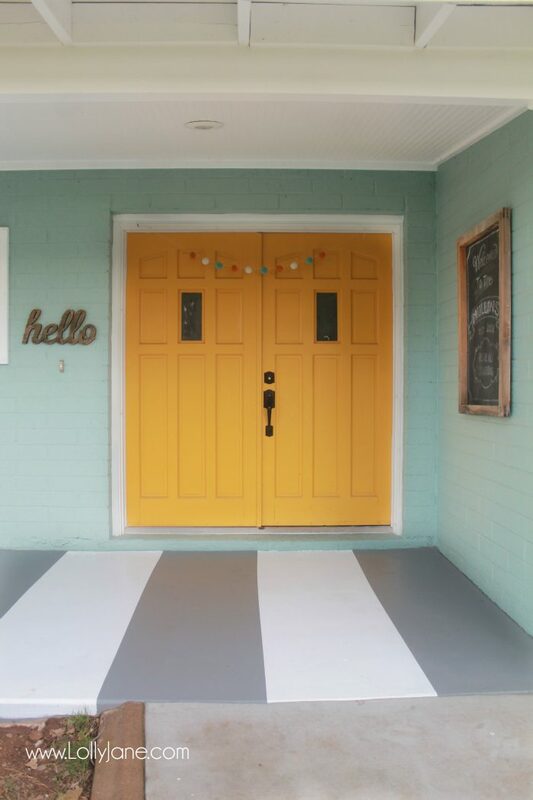 Creating painted striped concrete flooring on my front porch has been on my to-do list since we painted my craft room concrete floors last summer. 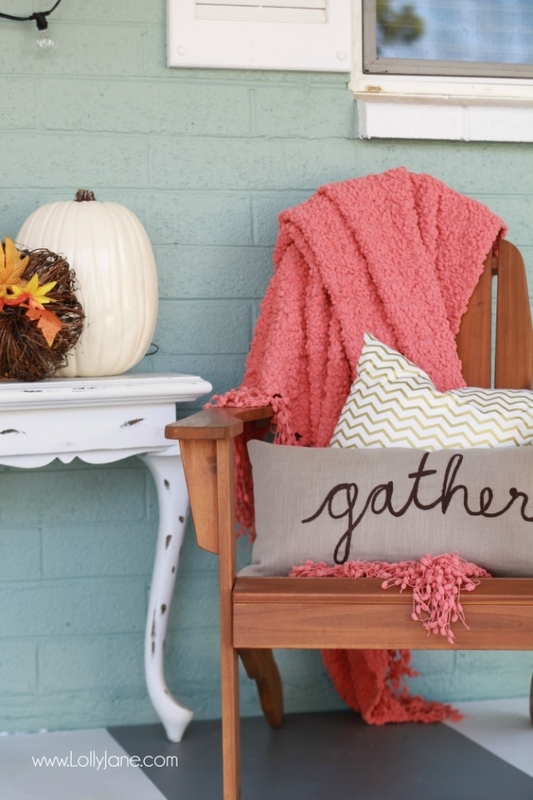 We live in our forever house so making the outdoors feel like an extension of the home is a must for me. 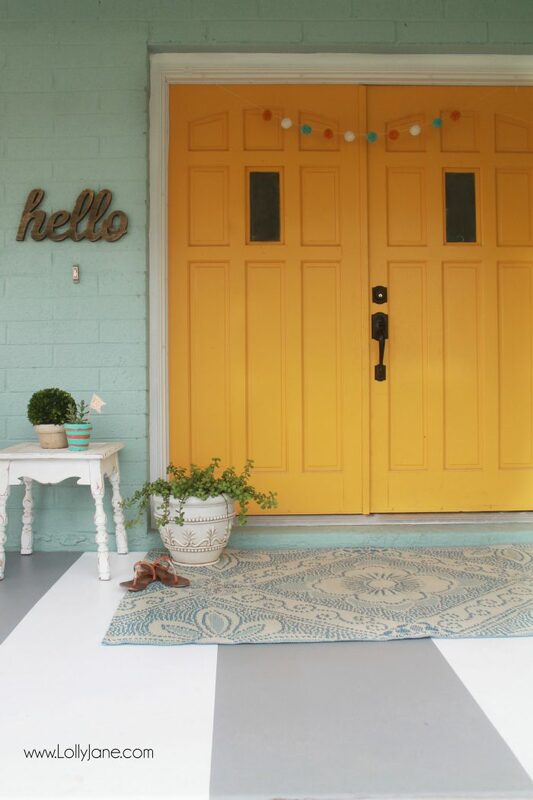 I want to have friends come over and grill on the back porch, neighbors to sit on the front porch with me, sip soda and watch the kiddos play. 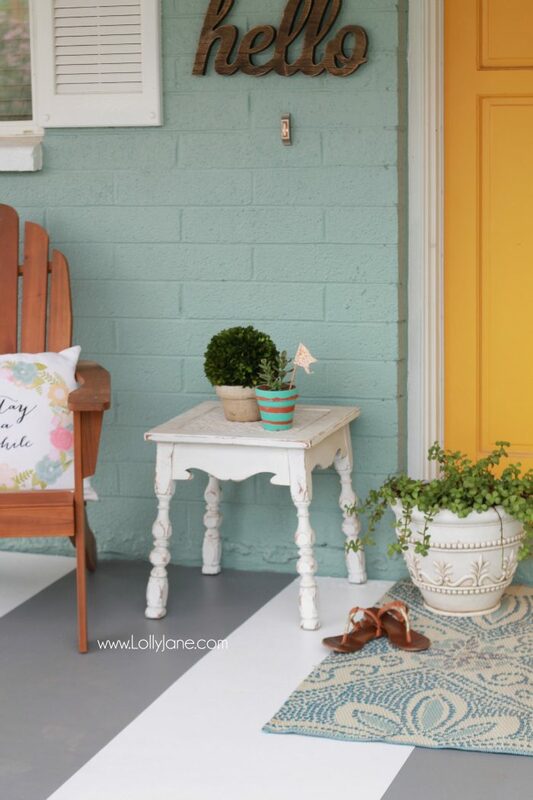 I love how my painted porch turned out, it feels more homey with just $100 and couple days of elbow grease. 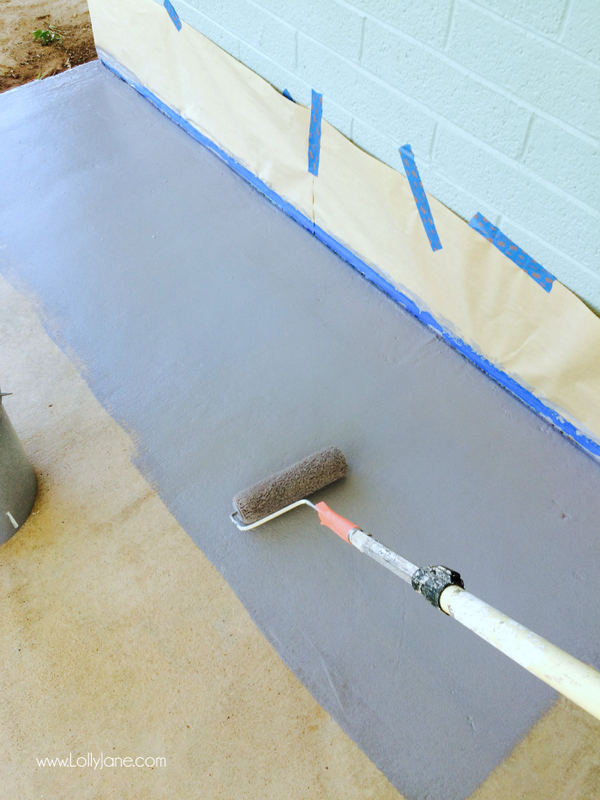 We used a water-based concrete degreaser and cleaner. After letting it sit for 20 minutes, we scrubbed the concrete down with a stiff brush at full strength and then power washed it. 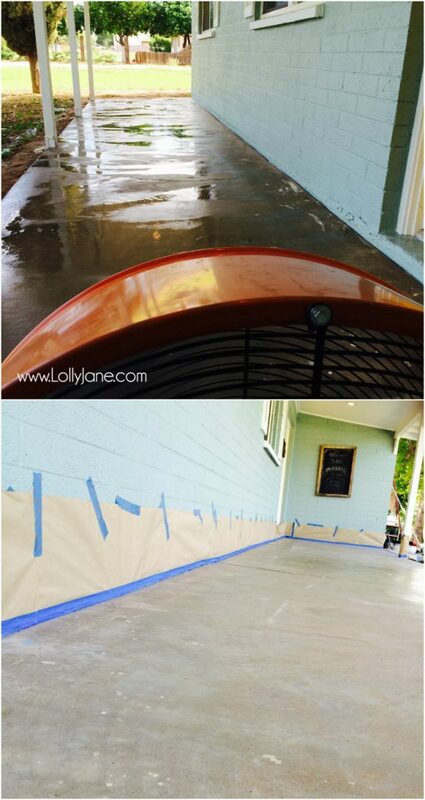 We used a fan to dry the concrete completely then taped off the house to protect it. Next step is painting! 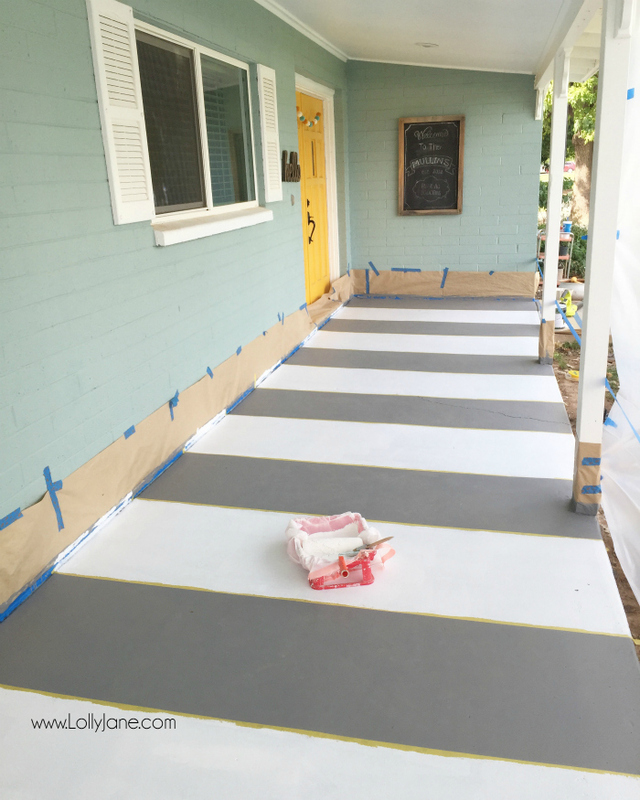 We used a specific porch and patio paint plus then used a 3/8″ nap roller for complete coverage. 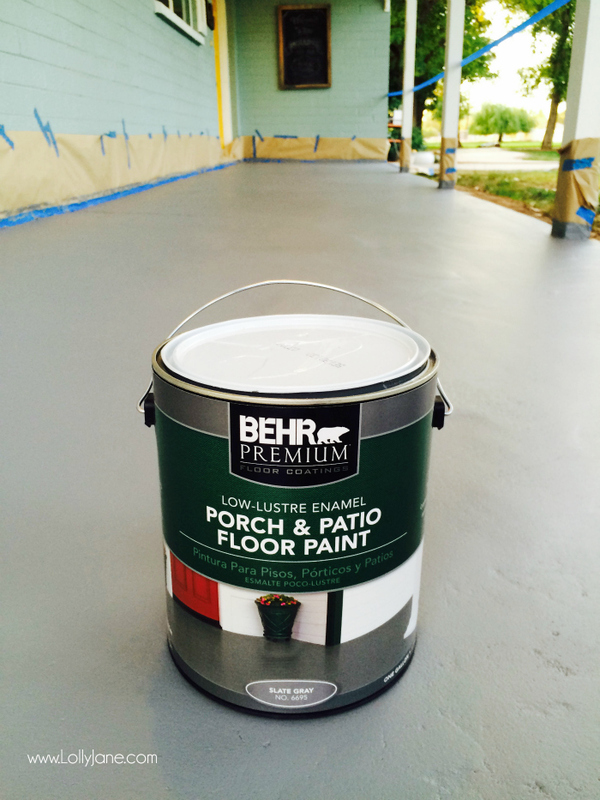 We painted two coats and used the full gallon on our 30′ x 5′ porch. 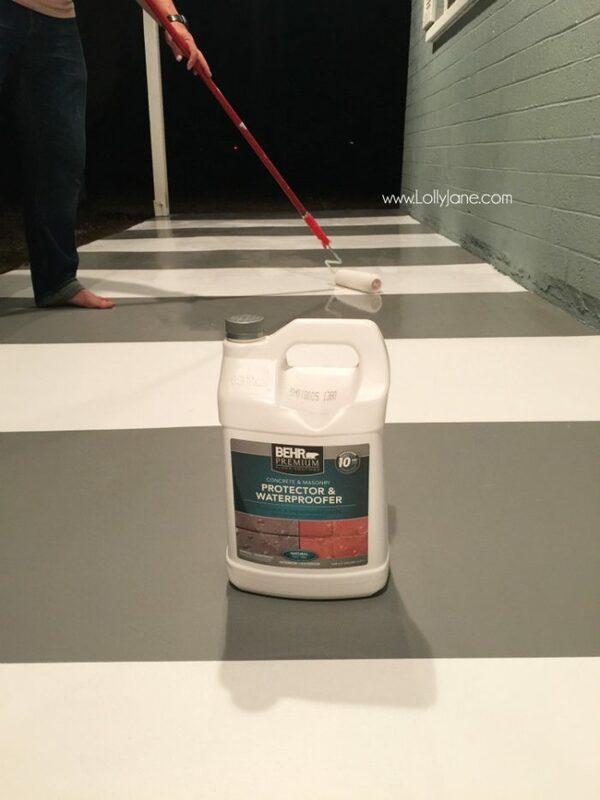 Be sure to allow full drying time (4-6 hours) in between coats. 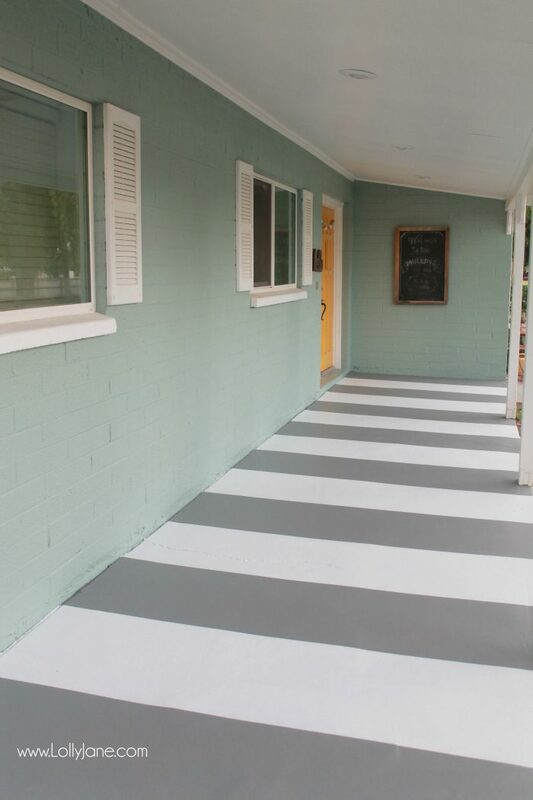 As far as colors go, we used the standard Slate Gray and white that came right off the shelf. 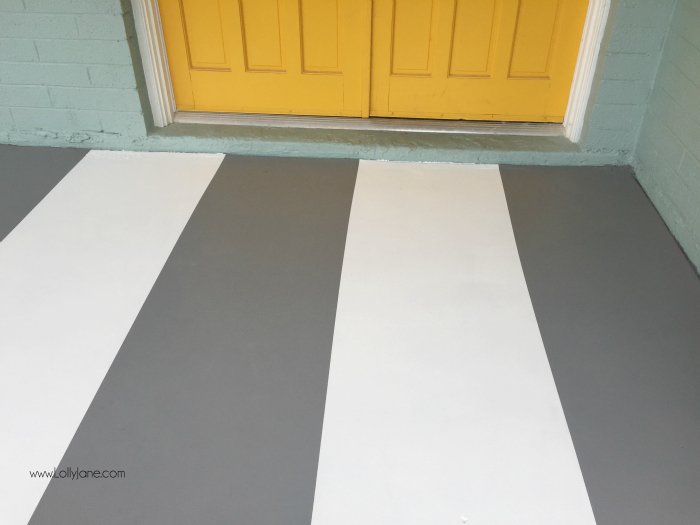 After waiting 3 days for the paint to cure, we used delicate surface tape to create stripes. We taped 24″ stripes by starting in the center. We taped one line making sure it was straight by measuring from the wall. We placed the second piece of tape 24″ across from it. To make sure you have even stripes, measure from the inside tape so you don’t mess up your 24″ increments. I had my hubby measure along with me to double check I didn’t make a mistake since you’re doing so many at a time. We drew arrows on the tape pointing to the lines that would be painted white. 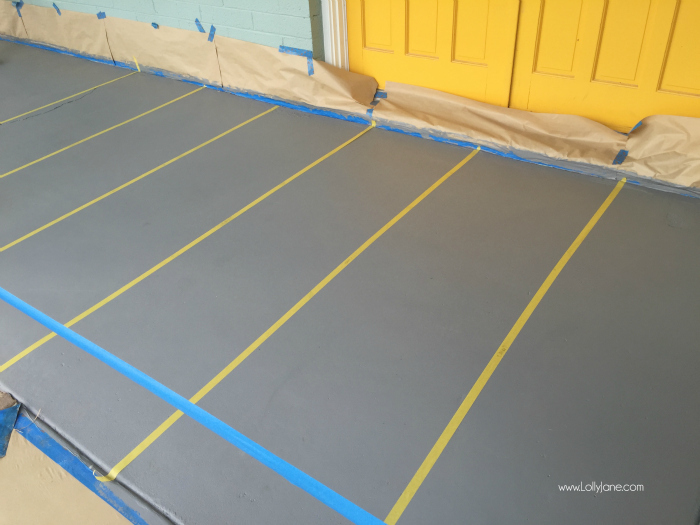 After 48 hours, we used a protector and waterproofer to seal the paint. 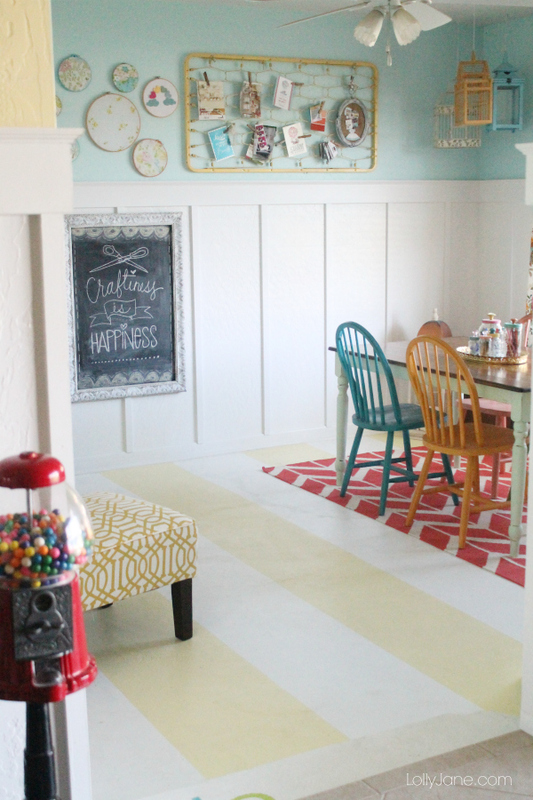 We rolled it on with a 3/8″ nap roller like we did with the paint. 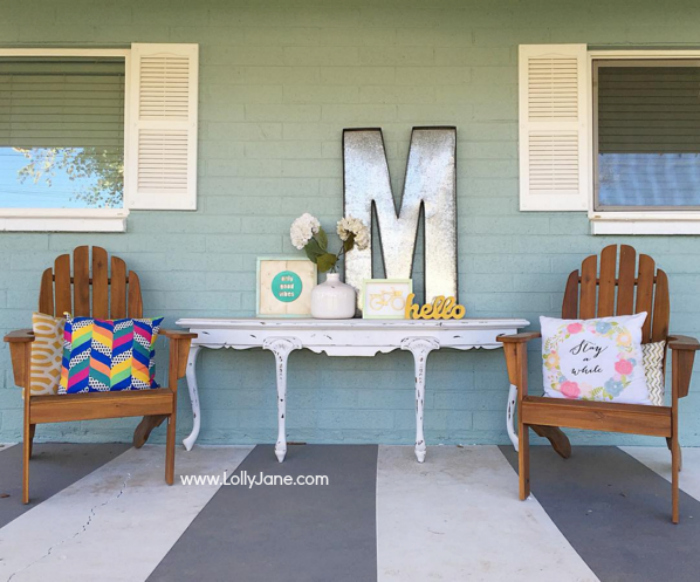 After 2 days, we put our furniture back on the patio and love the new look. We had an unexpected rain storm the weekend we sealed the concrete and appreciate how the water puddled up and didn’t penetrate the paint. Success. We love the final look! Here she is with a little furniture back in place. 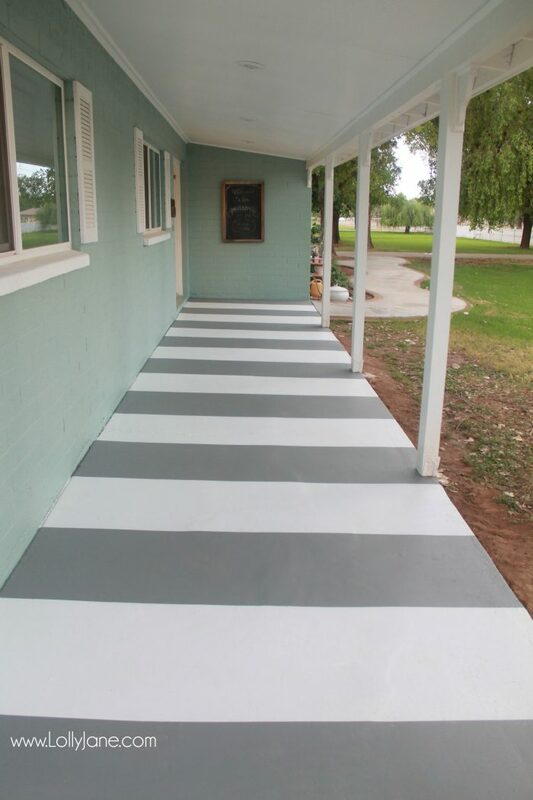 Please PIN so your friend’s can paint some pretty stripes too! 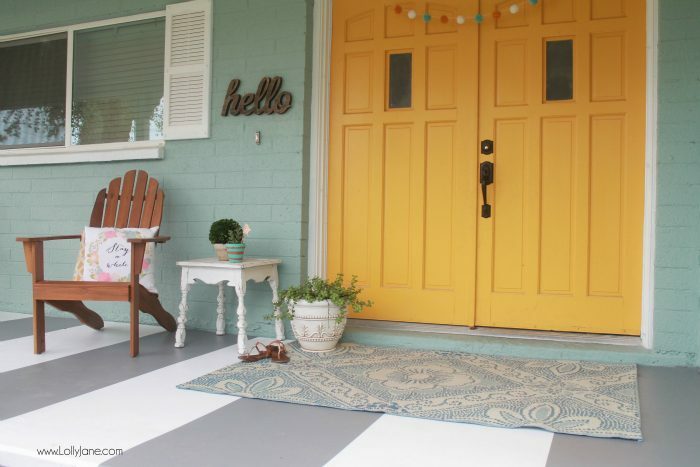 It’s been 4 months since I painted the porch and so far I’ve only had to wash it two times (both times after a good rain storm where dirt kicked up). To wash it, I use my hose and dish soap, that’s it. It’s held up beautifully and hasn’t chipped at all. 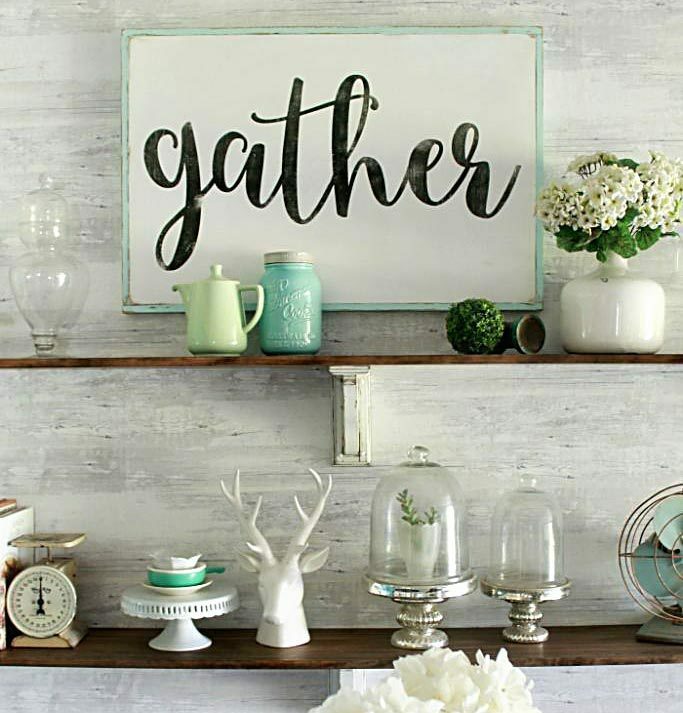 I personally won’t mind if it does chip over time, I love the distressed and worn look. I’ll share some more pictures soon when I finish the other side. So far I have my family room table from my gallery wall post. Under the two windows as you can see here in my fall popcorn bar post. I got a new couch from my La-Z-Boy trip that I’m excited to share soon as well. 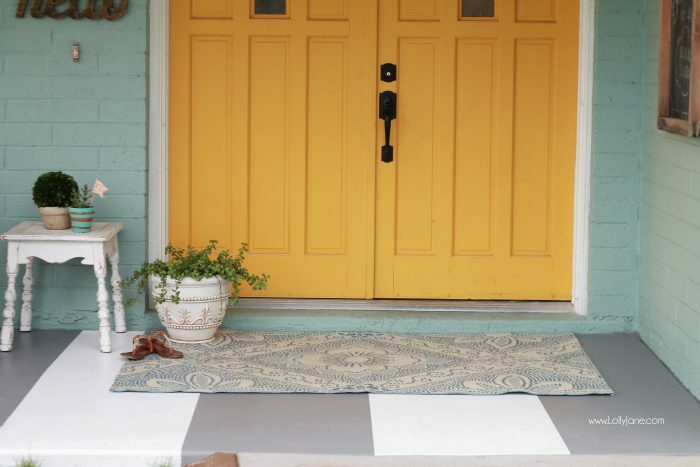 It’s gorgeous but the table didn’t make the cut and I love it on the front porch. I’ve always said I believe the outside of your house should be an extension of your home and it’s shaping up this way so far. 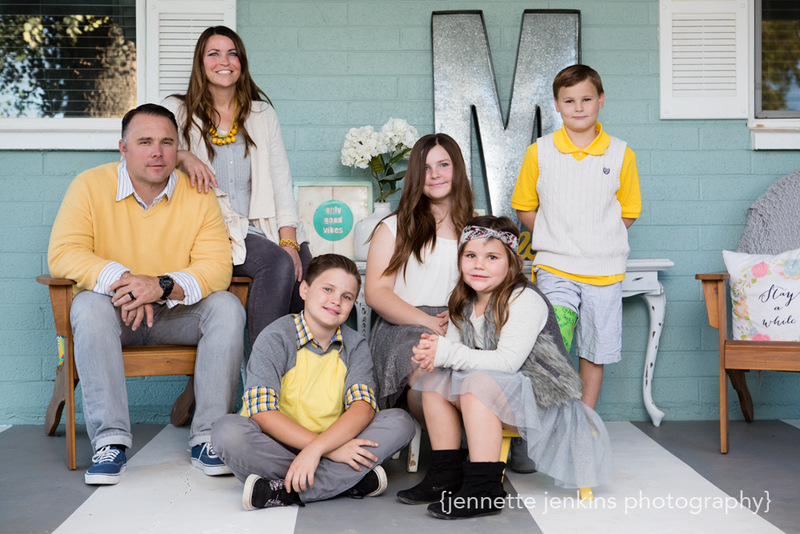 Here’s a junky iPhone picture of it..
and my family pictures this year using this fun M monogram I found at Ross for less than $30! 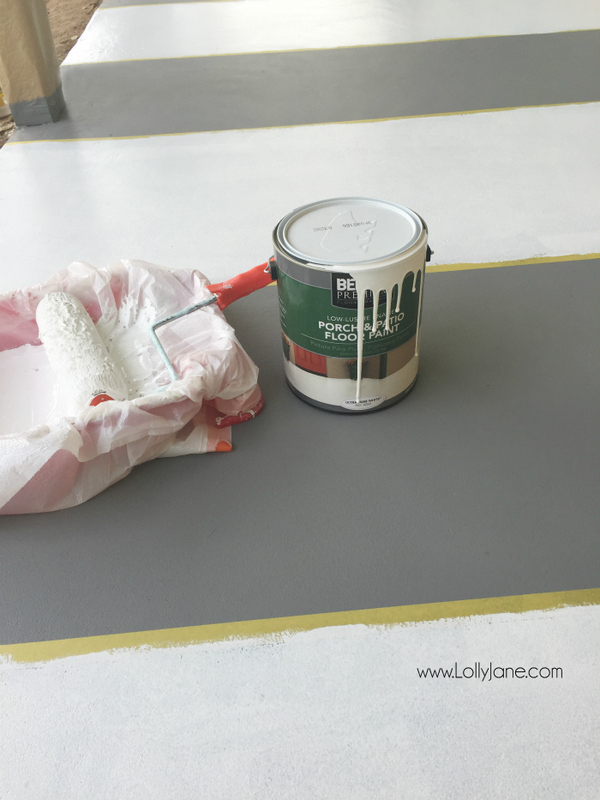 Check out our painted concrete floors in my craft room tutorial too!